If your wish is to take up yoga teacher training in Bali, you might have found yourself wondering about the variety of yoga styles out there? There are a number of names, schools, lineages… that it can get overwhelming and you’re confused about even where to begin! For the novices it might be simply looking to do some ‘yoga‘ and see where it will take you. For those who’ve been practicing yoga for some time, now there’s way more styles than when you first started out. Here are some of the newer styles that you’ll find in studios around the world. A style of yoga that suits partners and focuses on partner poses. Influenced in no small part by acrobatics and cheerleading(! ), it includes several moves that challenge strength and flexibility. Some poses can be balancing postures, while others involve a ‘flow’ from one pose to the next similar to a dance move. A traditional Ashtanga Vinyasa practice carried out alongside others practicing at their own pace and ability. A teacher offers guidance and adjustments that are tailored to each individual’s needs. Ashtanga practitioners may opt to dedicate themselves to a single teacher for a long period. This helps in developing a deeper bond and learn with someone who gets to observe their progress up close. Jivamukti stresses on the physical aspect (vinyasa-based) that adheres to five core tenets: bhakti (devotion), shastra (scripture), ahimsa (nonviolence, non-harming), dhyana (meditation) and nāda (music). It combines both ethical and spiritual practices to encourage veganism, environmentalism and social awareness. Practice sessions usually include chanting mantras and discussion of philosophy. Developed in the late 1980s by Larry Schultz, this style of yoga has been termed the “The Rocket style” because of the claim that “it will get you there faster”. Also with roots in Ashtanga Vinyasa, the practice incorporates poses from the primary and intermediate series, allowing students to practice challenging sequences without the need to progress in any fixed order or timeframe. Stand Up Paddleboard is one of the more established trend in new-fangled yoga. The emphasis is on executing postures on a paddleboard on calm waters (pool, lake or beach). The need to maintain the stability on the board adds a further challenge of balance and coordination while moving in and out of poses. And part of the fun is getting dunked in the water when you lose your balance! Yet another broad term for a yoga style that claims to heal the practioner in several ways. The desired effect can be either for the body or mind or both. Also commonly referred to as Yoga Therapy, this style has emphasis on easing one’s pain or discomfort and helping to restore balance and wellness. This style is suitable and beneficial for people suffering from ailments or those in recovery. 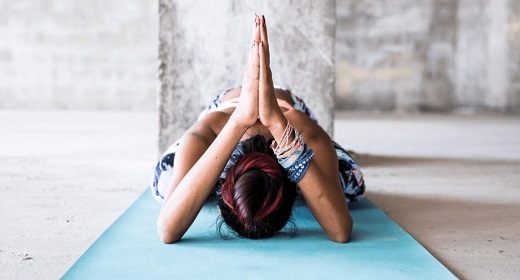 Another style of yoga that works on calming and centering the nervous system, to soothe the mind, increase immunity and develop a mood of deep relaxation. A restorative practice typically uses blankets, cushions and other props to set up the practioner in a comfortable pose. This relaxed mode helps release tension and makes one feel at ease.